Quest to be the Best! I found little at your site where I could suggest improvement, but I found a lot at your site which inspires me to improve mine. From valid code to grammatically correct, useful content, your site reveals years of hard work and the wisdom that has been gathered along the way. Thank you for this terrific example of a Gold – level website! We have your site evaluation processed and now ended and we would like to thank you very much for your application. You have an outstanding website that meets our award criteria, very easy navigation and a beautiful design with excellent content. Very well done work. We are presenting you with the Gold Award, our highest honor to a website. This is one of the best sites I have seen to date. As I created my website from simply using notepad and learning html and css coding I can appreciate the work that has gone into your site. The design, graphics and layout of the site is immaculate to say the least. A thorough evaluation took place using a selection of different tools, programs and tests and your site passed with flying colors. Not only was it aesthetically pleasing to the eye but the content was educational and interesting, once you start reading you can't stop. Therefore I am pleased to present you with our highest award, The Transitional Designs Diamond Award. Often I visited your beautiful website because I love it. Never had I liked spiders! But then I saw your bird spiders, learned about their life, their treatment, their anatomy and their love which sometimes end in a wedding tragedy, as the female kills her lover after mating. You dedicate your whole Website to this bird spiders. And the visitor first is fascinated of the perfect design, but little later also of your hairy Acanthoscurria or Aphonopelma or Avicularia. Now I can answer your question: How many eyes does a bird spider have? Thwo for the day and six for the night. WOW! Thank you for this beautiful site, I never can reach this quality, but now I know what means a perfect site. Please accept my MOON AWARD of EXCELLENCE as my admiration to your fine work! I have completed my review of Tim's Spider Site and it is very apparent that you have put considerable time and effort into your site. Your site is solidly put together, and obviously a valuable resource to visitors of your site. I am honored to present you with my 2006 Gold Award. Congratulations and thank you for allowing me the pleasure of reviewing your site. I have now completed the review of your site submission. We are extremely proud to present your site with the Award of Paradise gold Award. Thank you for giving us the opportunity to review your work, the visit was most inspiring. Your effort and dedication shine throughout your pages. You are truly deserving of our highest accolades, and for making the World Wide Web a much better and nicer place for us all to visit. Thank you for your interest in our Awards Program and Congratulations on such a fine web site. You have won the Cunningham Award of Excellence. I enjoyed my review of your website. Your website is extremely interesting. Our spiders are beautiful! The website is pleasing to the eye, has a consistent theme, and is easy to navigate. It is obvious that you have put a lot of thought and time into building and maintaining your website. You have done an excellent job! I also learned some things which I did not know before I came to your website, which is always a plus! I have a 12 year old son, and he also enjoyed your site. In our house, we always take the spiders outside in a paper Dixie cup and turn them loose! Please accept our award, and keep up the good work, you have an excellent website! This is to notify you that we have reviewed your website, and would like to offer you our Private Detective Web Award ©. You have done a fine job as we found your website enjoyable and well designed. It was rated 96 out of a possible 100 points as the graphics were clean, navigation was easy, and there was solid content. The design staff at NWESS is pleased to announce that your site has won the "NWESS Gold Award" Keep up the good work – a good web presence is never finished. It's always a "work in progress". You won my Gold Award of the CSB Award Program. Thank you for interest in the CSB Award Program and congratulation again for your beautiful site. Your website really rocks! With a nice graphic layout, a very good and complete content and an easy navigation, your website easily won my Concrete'n'Steel Award. I really enjoyed reviewing your website and I was impressed by the pictures, the videos and your spiders collection! Congratulations, you have won the Poetic Soul Gold Award for originality, design, content and ease of navigation! Congratulations for meeting all the criteria for my Gold Award of Excellence. I found your site to be a "WOW" site. Your content is very informative. Navigation easy to get around. And your layout very well put together. It is a pleasure to award your site my Gold Award of Excellence on a job well done! You and your awards program were one of my dominant role models. I am pleased to inform you that your site has won a gold award with a score of 100! We would like to thank you for your application. Our evaluators have visited your site and we are happy to anounce that you are the receipient of the World Wide Web Chanpionship Belt. After careful consideration and evaluation of your site, we are honored to present you with the Web Design Award! The site evaluation requested on http://www.timart.be was very pleasant on the eyes and very well structured out and categorized into specific sections this was a job well done and worthy of our award! We know how much work and dedication that has gone into this great web site that you have built and we have found your site to be among the best on the Internet and hereby award you with the Web Design Award! Tamurilart awards is proud to present you with our Gold award! This award is given to sites that excel in all aspects of content and design. These sites go above and beyond our expectations as evaluators and deserve recognition. Our evaluators had the following to say about your website: I have always admired the clean, professional look of your website! Your content is presented in a way that makes learning about spiders fun and interesting, and your entire website shows class and great attention to detail. This website is one–of–a–kind, and I appreciated the opportunity to review it. Thank you for applying for the Web Design Classics Award and inviting us to your site! What a fantastic site!! I really enjoyed my visit. You have met our criteria for the Gold Award. 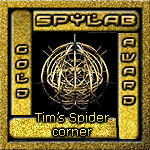 Your site, Tim's Spider corner, has won the Dragon Scale Award. Below are listed the points in which you received for each part of the Judging Process. I have enjoyed reviewing your site and will most likely be back for another visit. Because of the high information content spider Website and I for a very long time on yours site was. The first impression was already pleasant. Extensive contents your Web project have me on your homepage finds impressed the visitor all worth knowing one over different kinds of spiders. All in all very beautiful homepage. The Design of your Website is very good. Navigation succeeds without problems. The team of Evaluators at Ultra Free have all voted Tim's Spider Corner as the first web site deserving of the Ultra Free Unusual Site Award. It is a one of a kind award given to web sites that have earned the Ultra Free Gold Award of Excellence and is based on the unanimous decision of our Evaluators. Congratulations from the Team of Evaluators at the Ultra Free Awards Program. We have visited your web site and two evaluators have reviewed it. 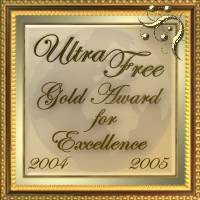 Your web site qualifies for the Ultra Free Gold Award for Excellence and one of the Evaluators is presenting his Choice Award. We have thoroughly enjoyed visiting your site. It is outstanding and creative, very well done. I am pleased to announce that you are winner of TKM Awards! 's GOLD AWARD! Your average score among our evaluators was: 106%. Lots of good information on the site... No problem pulling anything up. Loaded quickly on everything I pulled up... I like the format of the forum appeariance wise. Not looking that this is a HIGHLY decorated AP, but relatively excellant information. Navigation was great, overall layout was nicely placed, html coding was good, and the overall concept was excellant! I like it. Tim's site is a substantial reference to any webdesigner: clean and pleasing design, perfect coding, very easy navigation and excellent content. 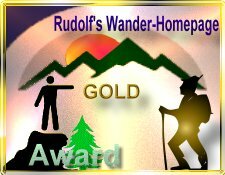 I have visited Your site Tim's Spider corner three times and I decided, that You have earned my Rudolfs Wander–Award in Gold. You have a great site. My gratulations. You earned 100 points for Your page. This is normally my award in gold. But with Your perfect site You have earned my Expert–Award with the number ts132004. Congratulations you have won Art Rose Award! I want to thank you for allowing me to review your site. Your site is exciting and your great work is on display and is evident on every page. Having been to your site many times. I can award you our top award with heartfelt sincerity. Your well designed site, your work with education and the awards program are a wonderful contributions to the Internet community. Continued Success. 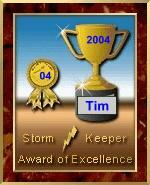 Your site has been chosen as a winner of The StormKeeper for this month. It was a pleasure to visit your site. you have a great site. There is only one award, no bronze, silver, gold –– so to receive this award your site must be exceptional. Congratulations, your web site earned a total score of 91/100 points and won the 4 star award! All your scores were outstanding. Thank you for your interest in ThiatraCat Awards. We've had a chance to visit your site, and we were really impressed by the work you've done. It's clear you've devoted a substantial amount of time and dedication to your work. Your site is excellent, and quite effective. Some of the photos gave Miss Fay the creeps! We are pleased to present you with ThiatraCat's Gold Award of Excellence. You've most definitely earned it. It gives me great pleasure to inform you that timart.be has won the Nobska Web Design Silver Arrow Award. We found your site to be elegant in terms of graphics, layout and navigation. Additionally the content was fascinating. Again, congratulations on a wonderful site. Keep up the good work! On behalf of Jaded Heart Awards, it is with great honor that I present you with the Jaded Heart Gold Award. I also must congradulate you on being the very first person to score a perfect 100 points! I found your site to be extremely well designed and your subject presented very well. Your site can be considered to be an authority on the subject of spiders and well worth bookmarking for research. It was really hard to keep my cats away cause they like spiders. We take great pleasure in telling you that after an in–depth review of your website you have won the GOLD Award. This is a fantastic achievement, and something you should be very proud of. Ice-berg Web Awards Team, 2004. 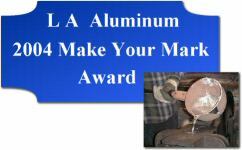 You have been chosen to receive L A Aluminum's Personal Site Award. This award is given to websites, like yours, that has outstanding content and design. Your site has met our criteria to win the personal site award, with it's great graphics, organization, no broken links and educational content. The evaluation of your site has been completed and the results are as follows: From a possible score of 100, your site received a score of 92. This means that you have won Bandit's Gold Award!! CONGRATULATIONS!! Our Gold Award is very hard to win, but your site did it!! Evaluating your site was indeed a pleasure! I found the site design very appealing and the content is very well presented. The overall site presentation is excellent!! It is evident that you have put a lot of hard work and dedication into your site, and you should be justly proud. Congratulations! We are pleased to present you with the Mystic Mage Award of Excellence. We have visited your site and found it to be exceptional. It displays all of the elements which make for excellence ... a high standard of quality, content and organization. We enjoyed your imformative pages on spiders and wish you the best. Please accept the attached award. It is our pleasure to inform You that Your web site has won 20 Internet Crown Award. Congratulation! Keep on with the good work and making internet a better place for humans. 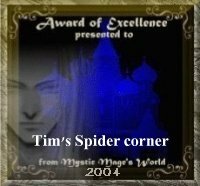 It is with a great pleasure and honor to award your site Tim's Spider Corner with the SFG Award Of Excellence during our evaluation of your site you gave us a insite into a subject that has not been show to us before. It is our hope that you accept this award and display it proudly. Thank you for applying for one of my awards. I am pleased to present you with my GOLD award. You have a truly beautiful site and I was very impressed with it. Congratulations. We have visited your site and found it to be just wonderful! We are proud to present you with our "Gold Quality Content Website" Award! Your site is very informative, original, easily navigated and excells in Quality of Content, Design and Composition! Your photography is outstanding! Final Score, 98 out of a possible 100, a score achieved by very few applicants. Thank you for your interest in Serena's Family Tree Award. Your site is easy to navigate, well put together and has a great design! A very informative and educational site. I enjoyed my visit and review of your site! Your website scored 40 points out of a possible 40 points! 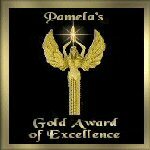 So, I am pleased to inform you that your site has earned my Gold Award! I am pleased to announce that your web site has won one of my awards. My awards are not easy awards to win at any level. A lot of hard work and dedication was evidenced. Your layouts and color schemes are wonderfully chosen. You have taken on some unique design tasks and executed them beautifully. I congratulate you on a job well done! Misspeds Awards is honored to have my award displayed on your most prestious site. Your score was 98/100, your award is Platinum! Hi Tim, thank you for your interest in WhiteFeather's Web Awards! It was a real pleasure visiting and reviewing your website. I found it very educational, interesting, detailed and extremely easy to navigate. A wonderful asset to the web community, your website has shown that every living creature has it's purpose, a wonderful reminder for us about conservation and nature. After reviewing your site per the criteria set forth within the WhiteFeather's Web Awards Program, I am pleased to inform you that your website has earned my Gold Award! Congratulations on a job well done! The Website offers Spiders and Information from Spiders. Navigation from Website is good. Design are easy. Thank you for application from World Fairy Award and all the best in the future. Thank you for applying for the Quest to be the Best award. I remember your site well, from previous visits! Now what woman would forget a site about spiders! Your site is very well done (in spite of my personal feelings regarding site matter) and offers much info to the spider enthusiast, alas I still cant help feeling sorry for that male spider *sigh*. Congratulations! After a review of your site, Tim's Spider Corner, we found your site design and navigation to be simple and attractive. Your content was interesting, wide–ranging, and with personal stories and photos that made it something that cannot be found elsewhere. Our judges have all visited your site, and have found it interesting, informative and a pleasure to surf through. We are very pleased to award you our platinum award. You have a wonderful site. Photos are excellent, layout second to none, and navigation a breeze. Your site has been selected to receive the "Gold" Award, from The World Wide Web Awards. Great Site, with nice graphics, flash, layout, design, easy navigation and appearance. Wonderful award program also! After visiting Tim's Spider Corner we found it to be an interesting and well maintained site that has obviously had a lot of time and effort spent on it. We would like to offer you one of the Fartown School awards and would be honoured if you were to display it on your site. You inform cheerfully prize winner that chose of my "Korea Orchid Bronze Award". I have visit your site several times and I am very glad to present you with my "Korea Orchid Bronze Award". As You have worked hard on your site. Congratulation to a job well done. I was very surprised when I saw how many spiders there are. It tooks a lot of time to collect this information. Also the short movies displayd on your site where very funny. I visit your site on a regular basis and found out that evertime something change on your site, for a job well done I award you with my Award of Excellence. Congratulations !! You are a winner. Your site met all the criteria for my award. Well done! !